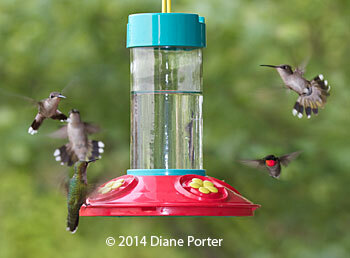 This is my main feeder for hummingbirds, my day-in-and-day-out, all-summer hummer feeder. I like it a lot, and I'll tell you why. This feeder does what many promise but few deliver — makes it easy enough to keep clean that I actually do it. The glass jar screws out of the base, and when you look at just the jar you'll see that it's like a wide-mouth Mason jar. You don't have to curl around a lip to get it clean. I squish my scrunchy dishcloth or my dish brush right inside, swish it around, and I have clean glass. The base is in two parts that come apart and let you run them through the dishwasher to get out any little bits of mold that might have started to collect in the feeding ports. I put the glass part through the dishwasher also, and then I feel good knowing I will be offering clean, mold-free nectar to my beloved hummers. You know how you sometimes get sticky sugar water all over your hands and arms (or the floor) when you carry a refilled feeder outdoors, because there's no way to set it or carry it that it doesn't drip? Well, that doesn't happen with Dr. JB's. The top of glass jar is shaped so that the yellow bail folds down and fits in a recession. That means you can set the jar on the counter and fill it. Then screw on the base, while the whole thing is upside down. Now carry it outside. When you get to where you want to hang it, quickly flip it right side up, and slip the yellow bail over your hook. Of course, they like most hummingbird feeders, but it seems like I get a bigger crowd of them around this particular feeder. Maybe because the nectar is always fresh, because I don't mind refilling it every day or at least every other day. Amazing how much it helps for cleaning the feeder to be easy. I've been using the same two Dr. JB feeders for four years now, and they are both still in perfect working condition. I've had many others feeders crack or warp beyond all semblance of usability in the past, but these don't seem prone to that kind of problems. Good quality materials and manufacturing, I guess. It comes in the red-and-blue version you see in my photos above. There's also an all-red version, shown at right. I like having one of each, both for variety's sake and so that I don't get them mixed up if I'm washing one and filling the other. Here's the recipe for hummingbird syrup. Remove water from the heat. Stir in one cup of white sugar. Cool the syrup before filling feeder. Do not use honey, which can cause a fatal fungal infection on the birds' tongues. Do not add food coloring to the solution. It's not necessary, and it may be harmful. You can store the extra syrup in the refrigerator for a week. Note that there is no reason whatever to add coloring. 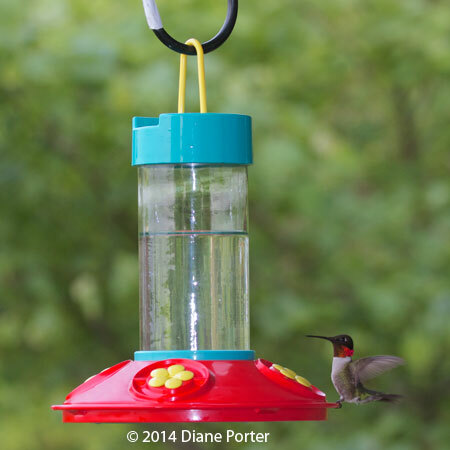 The red of the base will attract the hummingbirds, and the taste of the nectar will bring them back again and again. Warning: Don't let the syrup turn cloudy in the feeder — that's mold. 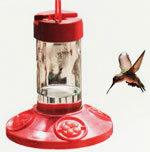 It will make hummingbirds avoid your feeder, and if they are desperate enough to eat it anyway, it can make them sick. Tip: If you do start to notice mold floating in the nectar or hiding in the base when you go to wash the feeder, rinse it in a 1/10 solution of chlorine bleach. Some people use white vinegar instead, and that seems to work also. 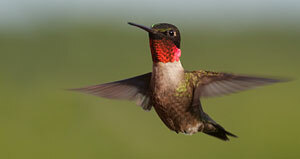 For a really easy start, try our easy-dissolving Hummingbird Food. It mixes even in cool water. It is absolutely not necessary, as it's pretty easy to boil up a batch of hummingbird nectar. However, sometimes it can be very convenient. It's also nice when you're giving a hummingbird feeder as a gift to include a 24 oz. can of this food as a starter.